97 years ago today saw the birth of a remarkable figure of 20th Century science. Rosalind Franklin is best known for missing out on her share of the Nobel Prize in Physiology or Medicine, awarded to Watson, Crick and Wilkins for the discovery of the double-helical nature of DNA. Despite this omission, her fame has increased rather than decreased over the years (the Nobel committee's official line is that it can only award the prize to three people, and never posthumously, and Franklin had tragically died before the award in 1962). As a woman, as well as Jewish and unmarried, she cut a rare figure in the early days of molecular biology - making her impact all the more impressive. Her photographs are among the most beautiful x-ray photographs of any substance ever taken - said John Bernal in her obituary in Nature. Her enduring fame is mainly due to just two years working on DNA at Kings College London. A greater portion of her short career, after a PhD on the pores in graphite for the British Coal Utilisation Research Association, were on the structure of viruses. From 1953 until her untimely death from ovarian cancer in 1958 she published a series of papers on the crystal structure of viruses, while working at the more collegiate Birkbeck College, London. She started with tobacco mosaic virus (TMV), a well established model organism, and one that even today causes economic damage to tobacco farms. TMV was the first disease shown to be due to a virus - or filterable agent (i.e. something smaller than a bacteria) way back in the 1890s. Forming reasonably regular rods, it was a logical candidate for the emerging science of X-ray crystallography, which Franklin has used so beautifully on DNA. 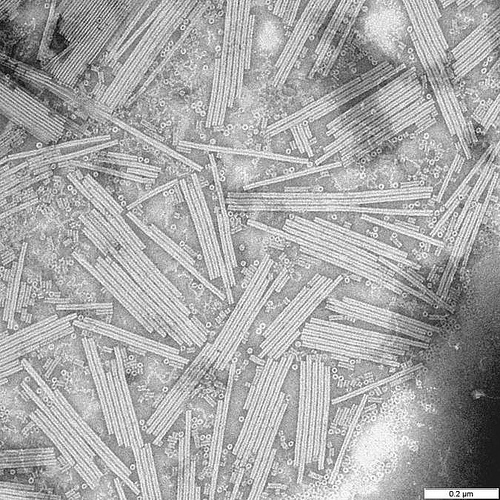 Crystal studies had been carried out on TMV but, as with DNA, Franklin's unmatched skill led to confirmation that the viral proteins formed a spiral hollow tube, with the nucleic acid - in this case RNA, rather than the more famous DNA, wrapped around the protein. A wry smile may have been raised by Franklin confirming the spiral tube hypothesis of a certain James Watson, who had proposed this during his work on TMV fifteen years earlier. She also showed that the viral RNA was a single strand, not a double helix like DNA. So much of this story is now canonical virology - a single strand of RNA wrapped in nucleoprotein, self assembling to form a rod-like virion. It all sounds very familiar, but then it was new and shocking. So much so that her collaborator at Agricultural Research Council, which had funded her work, stopped sending her viruses. She was, after her death, proved right on every count. 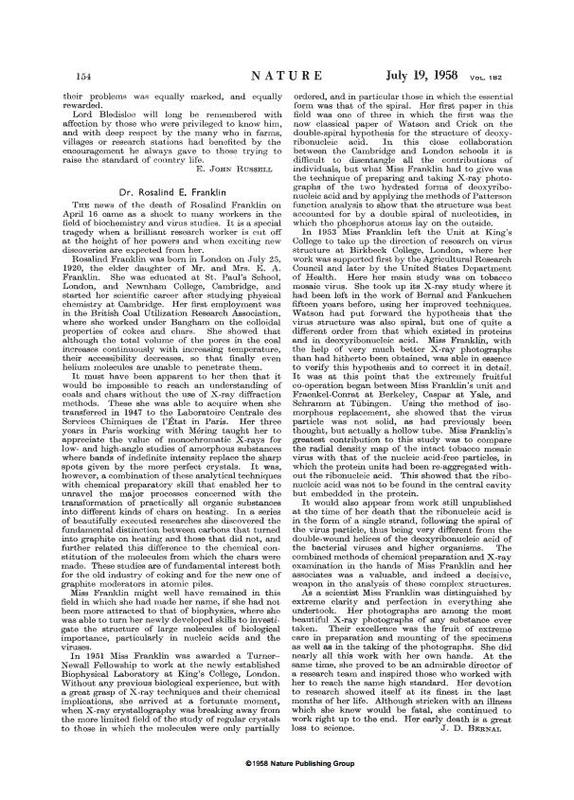 Franklin expanded her work to other plant viruses that were amenable to study with the same techniques: turnip yellow mosaic, tomato bushy stunt, pea streak, potato virus and then to human viruses. Polio had been crystallised in 1955 and Franklin sought to confirm and expand the structure of this important human disease. Polio was still a major killer, in London and around the world, with Salk's vaccine developed a few years earlier in 1952. 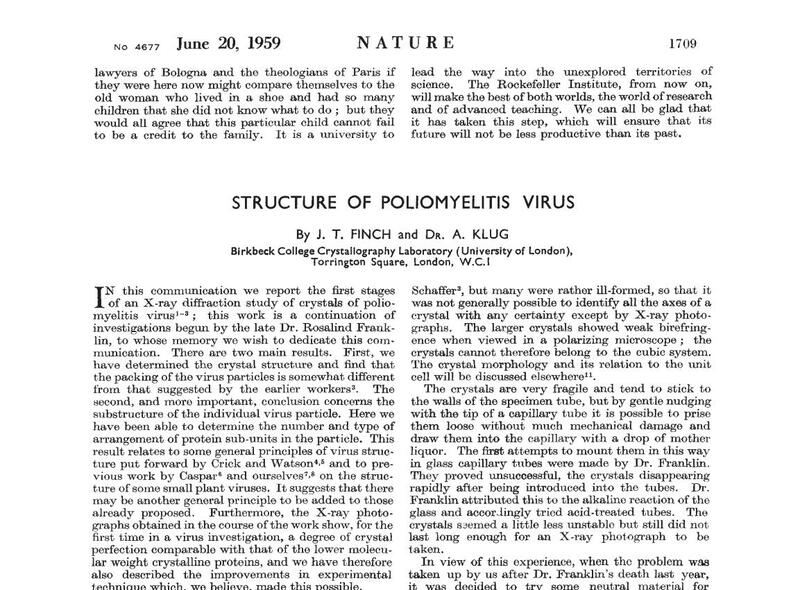 The polio crystal structure was published after her death by her co-workers Finch and Klug - and dedicated to her memory. Had she lived, the Nobel Prize may yet again have been hers - it was awarded to Klug in 1982 for his work on protein-nucleic acid crystal structures, studies that he started with Franklin. Her obituary from Nature is below.